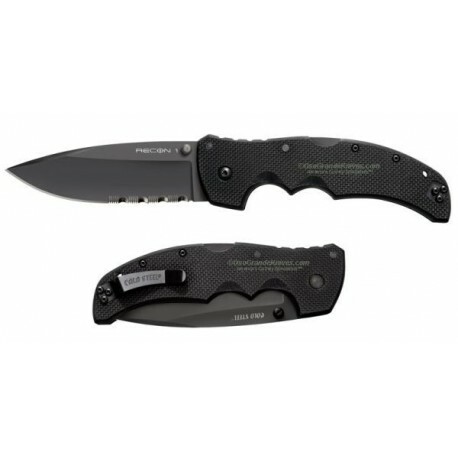 Cold Steel Recon 1-Spear Point Combo Edge. Overall Length: 9 3/8", Japanese AUS 8A Stainless steel, Stainless Pocket / Belt Clip. Cold Steel knives. Cold Steel is famous for raising the bar in the knife industry and our Recon 1® tactical folders are setting a standard that's hard to beat. Why? Because they are as tough as nails and will cut like a chain saw! Available with 3 and 4 in blades, every facet of their construction has been over engineered to make them as strong, durable and effective as humanly possible. The blades are made out of imported Japanese AUS 8A stainless steel that's been vacuum heat treated and sub-zero quenched and the handles feature G-10 laminate scales artfully contoured and scalloped for a terrific non slip grip. Plus, they are held together by the latest in high strength mechanical fasteners and further anchored by a 6061 heat-treated spacer. To complement their super tough blades and handles they're equipped with our revolutionary Tri-Ad lock™ , which practically precludes lock failure. To complement their tactical mission we have given each blade a tough, black, Tuff-Ex™ finish. Our testing has shown this coating offers three major advantages for tactical blades. First, it helps the blade to resist rust. Second, it eliminates glare and light reflections, which may give its user away. And third, it's a superior lubricant, which causes the blade to slip through even tough material with markedly less friction. This means you can cut deeper and far longer than with a non-Tuff-Ex™ coated blade. 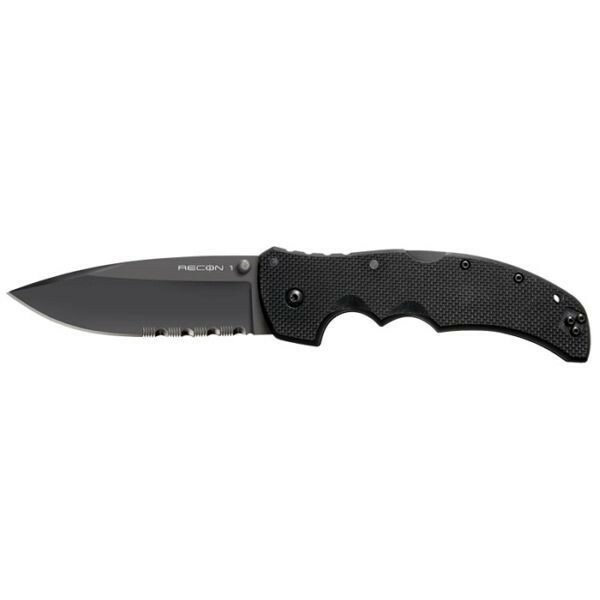 To make the Recon 1® as easy to open and carry as possible we have equipped each knife with a thumb stud and a small, extra strong pocket clip. This clip is completely ambidextrous so lefties please take note. What's more its small size doesn't abrade or irritate the palm under protracted use.